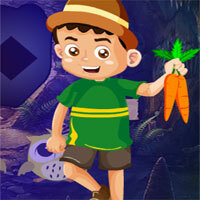 G4k Carrot Boy Rescue info about the game-Games2Rule. One carrot boy was living in village. That carrot boy was very beautiful. There was an old house in that place. The carrot boy went to see that old house around. He was unexpectedly stuck in the old house. You have to help save the carrot boy from there. Find out hidden puzzles and spells to save him. Find all the spots and save that carrot boy from there and congratulate you to win the game. The tricks of the trick are a little harder to find, but somehow it may be a matter of interest.